We are organising a two-day workshop for teens – Journalism for Young Citizens – at Atta Galatta on May 3rd and 4th. For more information and to register, click here. Several Bangaloreans are running at the TCS 10K in support of Citizen Matters, to raise funds for coverage on specific topics. See Shilpi for Lakes and Thej for Open Data. Pledge your support today! Manhole deaths are seldom solitary affairs. Earlier this month, two manual scavengers died from asphyxiation while cleaning up a 15-foot manhole in Doddaballapur. Two youngsters from the area tried to rescue them, but in vain. Read this poignant piece on the lives of sanitary workers. The BDA and Environmental Clearance Committees sanctioned a real estate project on the wetlands between Kasavanahalli and Kaikondrahalli lakes. Experts say it will affect the lakes. With residents opposing, the case is on at the National Green Tribunal. Read: 870-unit realty project helping kill lake wetlands off Sarjapura Road. Also see: Sarjapur Road residents ask govt to save Kaikondrahalli, Kasavanahalli lake wetlands – A citizen report . On to some more cheerful news: From green to clean – update from Puttenahalli lake. Little data is available on what ails Bengalureans. But the available data on cancer, shows increased lung cancer due to air pollution. Nobody knows what other factors are affecting the health of Bengalureans. Read: Why we don’t know what ails Bengaluru. Also: No studies, no data: air pollution continues to haunt Bengaluru. BBMP, BDA, BESCOM, BWSSB, and other organisations should stop the practice of accepting deposits and payments from developers on behalf of homeowners. Instead, they should set up a system by which the homeowners can directly make the payments themselves. Read: Stop allowing builders from becoming ‘agents’ who hoard black money! What is the Everyday City’s relevance to Bengaluru? Is it a glimpse into everyday life or everyday places asks Kiran Keswani?See: Everyday City. 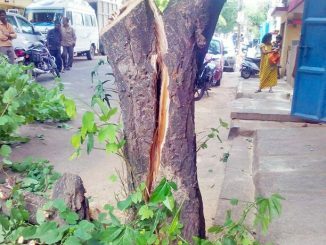 Spurred by a recent tree cutting incident in the vicinity of the Indiranagar neighbourhood, several citizens got together to learn more about the trees in the area. Here are snapshots from the tree walk. When we talk of conservation, we often think of trees, water, mammals and birds. However, there’s a world of wonder in butterflies too. Rohit Girotra, founder member of the Bangalore Butterfly Watcher’s Club says butterfly habitat near Bannerghatta is under threat. Here’s why. Minstrels and troubadours were travelling musicians of the medieval age. Chitra Srikrishna talks about how they have evolved over time. Read: Minstrels through the ages. BBMP got a new Commissioner this week. Kumar Naik who served as the Commissioner for one year has been transferred and IAS officer N Manjunath Prasad has replaced him. The new Commissioner said that filling potholes before the monsoons and ensuring green cover in the city are his immediate priorities. Within four days of the transfer of BBMP Commissioner, Assistant Commissioner (Advt) of BBMP K Mathai too has been transferred. Mathai was in the news for submitting eight reports on advertisement revenue collection flaws in BBMP. With online property tax collection facing some technical glitches, tax collection has seen a slump in the first month. According to news reports, the BBMP which had collected Rs 400 crore in April last year, has collected only Rs 170 crore this year as on April 26th. Bengaluru hit the highest ever maximum temperature for April at 39.2 degree Celsius on April 24th. The maximum temperature recorded till then was 38.3 degree on April 30th 1931. A panel headed by a retired High Court judge will look into the irregularities in BBMP which were earlier highlighted in the Kataria Committee report. Development Minister K J George has said that the panel will also have three retired engineers and will act as a fact finding team to look into legal and technical aspects of the Kataria Committee report. Even as the State government has shelved the BBMP Restructuring Committee report that proposed that BBMP be divided for better administration, Chief Minister Siddaramaiah in a recent programme said that he is in favour of dividing the city, and splitting BBMP into smaller corporations would help provide better administration. Featured event: Citizen Matters is organising a two-day workshop for teens – Journalism for Young Citizens – at Atta Galatta on May 3rd and 4th. French comedy film, Les garçons et Guillaume, à table, is being screened at Alliance Francaise on April 28th. Celebrate World Dance Day by watching a performance at Alliance Francaise on April 29th. Emil was the nickname given to Adolf Hitler. Watch Emil’s Enemies, directed by BLT’s Vijay Padaki at ADA Rangamandira on April 29th and 30th. Houses of Malgudi, a heritage walk through some of Malleshwaram’s oldest houses is happening on April 30th. Head to Mantri Square Mall on April 30th for Click a Smile, a photography exhibition featuring the best entries received for Akshaya Patra’s photo contest. Watch Akshayambara, an award-winning Kannada play that employs the dance form of Yakshagana to raise questions on female representation and male ownership at Rangashankara on April 30th and May 1st. Fanfare Couche Tard (Night Owl’s Band) is performing at The Humming Tree on April 30th.